Dozens of Czech hospitals could find themselves struggling to provide basic care on 1 March after almost 4,000 doctors - one quarter of the total number working in the country's hospitals - tendered their resignations in protest at low wages. The resignations are being co-ordinated by the doctors' union (Lok), which says successive Czech governments have done nothing to improve doctors' salaries since the fall of communism. Peter Papp, 31, is an oncologist working at a hospital in Usti nad Labem, an industrial city about an hour's drive north of Prague. He spent six years at medical school followed by three years on the cancer wards of two district hospitals. With maximum overtime, Dr Papp's gross salary is $1,165 (£750, 880 euros) per month, well below the national average. After tax, health and social insurance payments, he takes home around $900 dollars, less than a car mechanic or waiter. With rent in the Usti area at around $350 per month, he is left with slightly more than $500 to feed, clothe, transport and entertain himself. After devoting the last nine years of his life to medicine, Dr Papp has had enough. "I'm not willing to work for the salary of a McDonald's employee," he told me, pointing out that he had made more money teaching English to pay his way through medical school. Dr Papp is one of 3,837 Czech doctors who have submitted formal letters of resignation to their hospital managers. On 1 March, he will be unemployed. "I have a little amount of money to sustain me for a month or two," he said. "I'm already sending applications to several companies that send doctors to Ireland and the United Kingdom. I'm also thinking about Australia or the United States. "I wasn't trained to treat particular nations. A sick person is a sick person anywhere in the world." The mass resignations have been orchestrated by the Lok union under a slick PR campaign called "Thank You, We're Leaving". A battered ambulance toured hospitals in December advising doctors on how to quit their jobs. 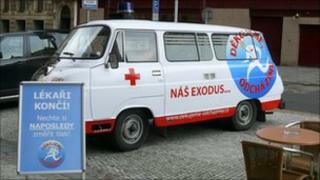 There was a grim message for Czech citizens written on the side: "Our exodus - your exitus". "We didn't start the brain drain," said Dr Martin Engel, a radiologist at Prague's sprawling Vinohrady Hospital and the chairman of the Lok. After 30 years of experience and numerous specialist qualifications, Dr Engel earns $2,230 per month, including overtime and before tax. "Doctors have been leaving this country for years," he told me, his face betraying a mixture of anger and resignation. "What we're trying to do with this campaign is stop it." As we recorded the interview, a colleague entered the tiny room shared by the two men and changed out of his threadbare white uniform. "We want real change and we want it now," he explained. "We're not waiting for 'reforms'. We want money. Then we can talk about reforms." Health Minister Leos Heger says there is simply no room in the budget to meet the doctors' demands. He has asked them to wait for the impact of the government's planned healthcare reforms. Mr Heger remains unmoved by the protests, telling the Czech media this week that even if all 3,837 did leave their jobs, basic care would remain unaffected. That is an optimistic prediction. In one region, the Vysocina, 80% of all hospital doctors have handed in their resignations. If they do quit, some hospitals may be forced to close. And there is the rub - if they do actually quit. The health ministry told the BBC it was unlikely so many Czech doctors could find work abroad. Most, said a spokesman, had neither the language skills nor the special pan-European qualifications needed to work elsewhere. There have already been reports of doctors rescinding their letters of resignation. The doctors' union says those reports are exaggerated and points out that most of its members do not want to leave the Czech Republic, merely its state-run health system. Many, says Martin Engel, can easily find work in privately run clinics. So it is a game of high stakes between physicians and politicians, and the outcome is uncertain. If the doctors are bluffing and the government stands firm, Czech healthcare - and Mr Heger - will survive. If they are not, many patients will be in for a nasty shock on 1 March.